Passion and a pride in workmanship. That's how the Artful Canine came to be. "I found it hard to find nice looking dog collars that were also durable and comfy," says founder Joanne Wood-Ellison. And then came the idea, "Hey, I can do that!" That was back in 2009. And here we are today, a small but crafty group of folks making beautiful dog collars for beautiful dogs all across the country! We design & manufacture all of our collar, leash and harness products here in Sarasota County, Venice, FL. As the maker, we can ensure that our products are always in stock, and can offer customized variations of our products to meet you & your dogs needs. We’re all about quality and the details. We’ve been crafting collars since 2009, and have become pretty good at making an artful, durable and comfortable dog product. If you look closely at our collars, you’ll notice the hallmarks of a well-made item: tight, even top-stitching; thick thread; strong hardware; tightly woven fabrics and smooth edges - all backed by a 1 year guarantee that says we stand behind what we make (except if your dog chews or eats it!). Folks think we are bigger than we really are. That’s because we make every effort to provide a shopping experience that rivals the big boys, but with the personalized service you can only get with a small shop. We also have a factory outlet store which is open to locals & visitors. 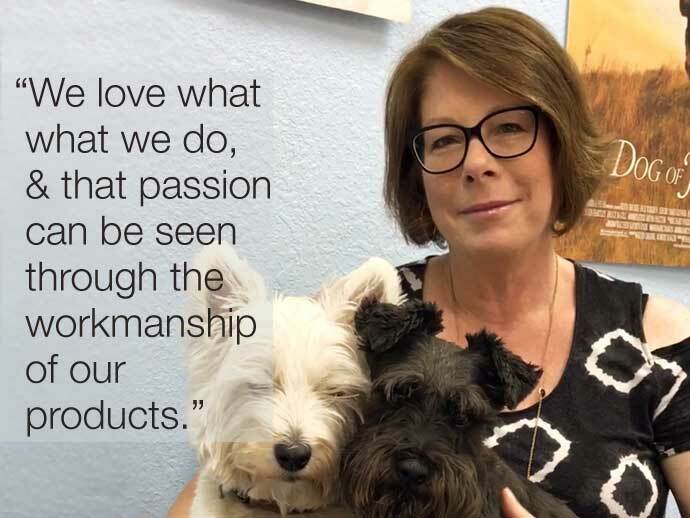 Our team is made up of crafty & clever people who sew & assemble every Artful Canine product. They are expereinced in the lost art of sewing; have a meticulous eye for detail, and take pride in the work they do. When you touch and feel an Artful Canine product, you are getting the best of what these folks do. Our goal is to create products that are comfortable, affordable, functional, durable, fashionable and artful. Our intent is to offer a broad range of designs that will have your dog looking sharp and feeling comfortable day in and day out. While the Artful Canine is just one of many retailers you can shop for dog collars & accessories, we view ourselves as being the only company that can offer you high quality & style at a great value.